The first thing you notice about Sandon church as you walk through the lych gate is the early 15th century tower, and specifically its gargantuan brick buttresses. These were added in the 17th century* when presumably the tower was believed to be in danger of collapsing down the hill. Whoever built them was evidently more interested in practicality than elegance; they're like Brobdingnagian slices of cake, but no one could claim that they don't make the church memorable. I rather like their no-nonsense, let's-get-this-job-done-once-and-for-all attitude. Incidentally, the brick courses aren't horizontal, but slope inwards, probably to try to make them structurally stronger. The contract is between the Dean and Chapter of St Paul's Cathedral, who owned the advowson of Sandon, and Thomas Rykeling (or Rickling as we'd spell it). He was paid twenty marks (a mark was a two-thirds of a pound, 13s 4d). It's extremely hard to translate medieval money into modern amounts, but the author of the English commentary on the contract says that it would be the equivalent of nearly £267 in 1914, which in turn is the equivalent of just over £30,000 in 2018 (the Bank of England's inflation calculator doesn't believe that 2019 has happened yet). Rickling would have had to pay for all materials and labour out of this sum. I think the Dean and Chapter got a bargain. What's particularly interesting about the date of the contract, 11th July 1348, is that this was the year in which the Black Death reached England (by June). We tend to think that everywhere stagnated as the plague devastated Eurasia, but life clearly went on in Sandon. (There's nothing to suggest that the chancel took an unusually long time to build.) Maybe Sandon, as an isolated rural community, just got lucky and avoided the worst of the outbreak. It's generally accepted that the Black Death marks the watershed between the exuberant Decorated style of architecture and the more austere Perpendicular. 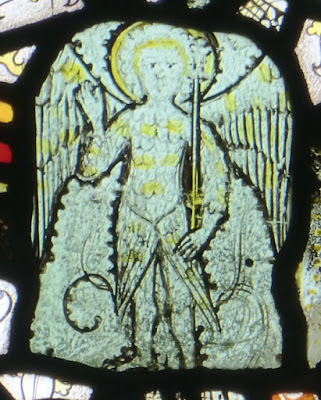 Most of the windows (including those in the chancel, which must date from soon after 1348) are in the latter style (there are a couple of rudimentary Decorated windows in the north aisle), but one stands out from all the others. It's the east window of the south aisle, and it's lovely. The Victoria County History dates it to 1360-70, but I can see no reason to think that it was designed after the stiffly traceried windows of the chancel, and Pevsner's suggestion that it predates 1348 is far more convincing. It has four lithely twisting mouchettes, forming two Gothic yin yangs. Very unusually, the main arch of the window isn't really pointed at all. Why this is so is mysterious; presumably it was just a little quirk of the architect. The interior of the church is light despite the almost complete lack of clerestory windows (there are two small ones at the east end of the nave designed to illuminate the now vanished rood loft). The loft is gone but the screen on which it once stood remains. It's 15th century, plain but dignified. At the back of the nave are some similarly plain benches, though enlivened by poppyheads (some with faces), of about the same date. In the tower window there are some fragments of 14th or 15th century glass, including this angel who seems to be wearing a pair of wings as a skirt. His torso is covered in feathers like fish scales, and raises his right hand in blessing, though it looks more like a cheery wave. There are a few other bits and pieces of glass, less decipherable, in other windows. On the floor in front of the screen is this better than average brass, to John Fitzgeffrey (d.1480) and his wife Elizabeth. His armour reminds me of a beetle's shell, and she poses with her fur-trimmed robe and extravagant butterfly head-dress as if for a fashion magazine. He stands on an ox (which animal also appears on his heraldic shield), while she has a tiny dog with belled collar at her feet. We don't know when she died as, although a space was left on the brass for her date of death, no one ever got round to filling it in. The brass on which their sons appeared has disappeared, but that on which their daughters feature remains. Unusually, their names are given: Agnes, Elizabeth, Elizabeth (probably the first Elizabeth predeceased her sister), Elienor, Jane and Margarett. The Jacobean pulpit is a very decorative piece. Moving from the nave into the chancel (which as we've already seen was built soon after 1348) we find that although the windows are in the brand new style now known as Perpendicular, the interior details are still in the earlier style we call Decorated. The sedilia (seats for the clergy) and piscina (drain for washing the communion vessels) are ogee-headed, in other words have the distinctive S-shaped arch. The small Easter sepulchre on the north side (in which the consecrated host was placed on Good Friday and removed on Easter Sunday, reenacting the Resurrection) has five little crocketed gables, and the arch is adorned with tiny rosettes, a typical feature of the style (it can be seen on a grander scale at Wheathampstead elsewhere in the county, for example). So in some respects Rickling was a stylistic pioneer, but in others he was conservative. Sandon church wouldn't feature on many people's list of the ten best churches in Hertfordshire (it doesn't even make John Betjeman's list of the 53 best), and yet there is plenty here to reward a visit. (I've always found the church open.) The richness of the heritage of England's parish churches runs deep. * Though here it is claimed that the date 1763 can be found on the brickwork; I haven't looked for the inscription so can't confirm this. ** Or could it be cast metal?